Most of us are familiar with the usual experience of Disney Dining: advanced reservations, crowds, more waiting and a high price tag for the luxury. 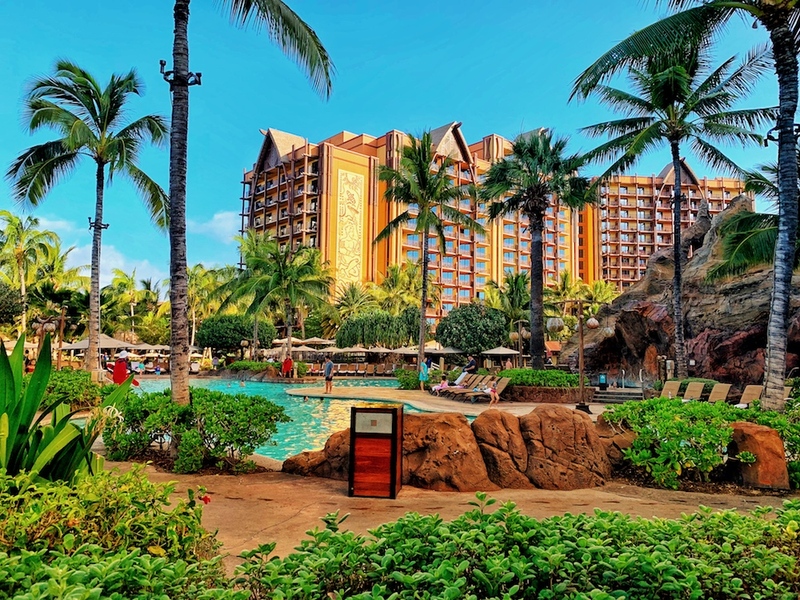 These are the things that I had in mind when driving the 36 minutes from my usual haunt in Waikiki to Aulani – A Disney Resort and Spa in Ko Olina. I had made a reservation just the night before with my preferred time slot not-surprisingly unavailable, so I was prepared for the usual Disney experience. Thanks to the quieter roads on Sundays, we arrived at the resort around 30 minutes earlier than expected. 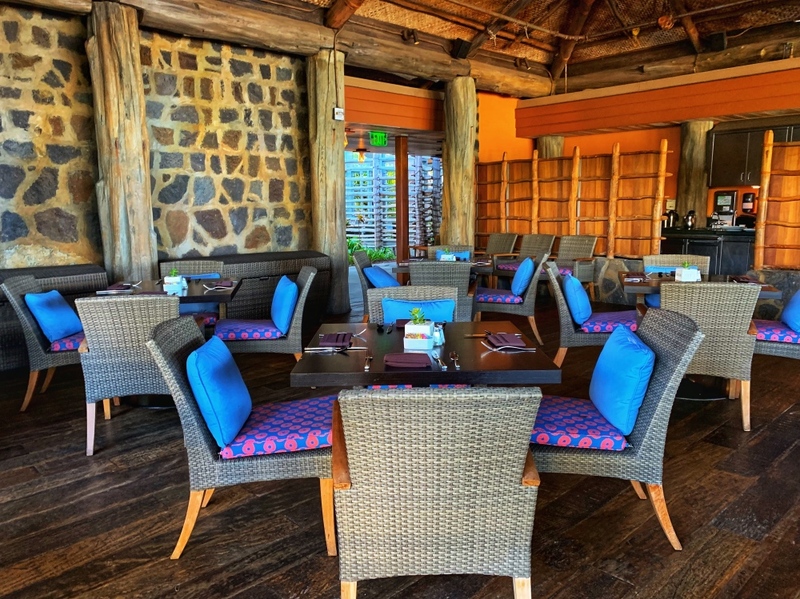 Once we had weaved our way through the beautifully decorated lobby with authentic island wooden accents at every turn, we made our way out to the beach front where the table service restaurant ‘AMA ‘AMA rests. 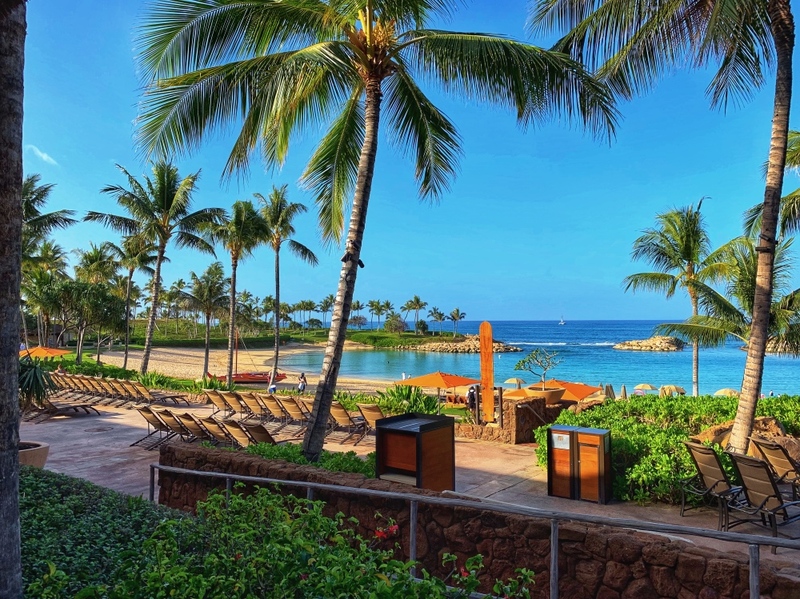 The sun is slowly rising over the western-facing resort, and as the shadows recede from the beautiful surroundings and private ocean views, the beauty of this place really comes to life. Our family of six is quickly seated at a large round table that could easily accommodate eight or more; this allows for lots of extra room which never goes astray with kids at the table. Our server Jocey is absolutely lovely and full of the early morning smiles that Hawaiian fairy tales are made of. While the three adults sit quietly at the table with a combined look of hunger and don’t-come-back-without-coffee, her kind and soft-spoken demeanor were enough to make anyone feel welcome and at home. Large open-style chairs with a variety of cushions accommodated the squirmiest of children and kept everyone comfortable. The view of the private beach and lagoon area proves to be every bit as beautiful as expected, made more enjoyable by the fact that it was just about empty, even as we walked out the door when finished with our meal. The majority of morning guests were centrally located around the pool and water slide area along with the character breakfast, which was pumping with a line out the door. To us, this was a much more enjoyable way to start the day — quiet, calm, and ready to take in the beautiful views of the area. Palms sway against the blue sky backdrop while you wonder how you will ever manage to go home. Then again, that is the feeling you get all over Oahu. This magical island is full of cinematic scenery, beautiful people and a culture that is warm and inviting. No matter where you stay, going home is going to be problematic. 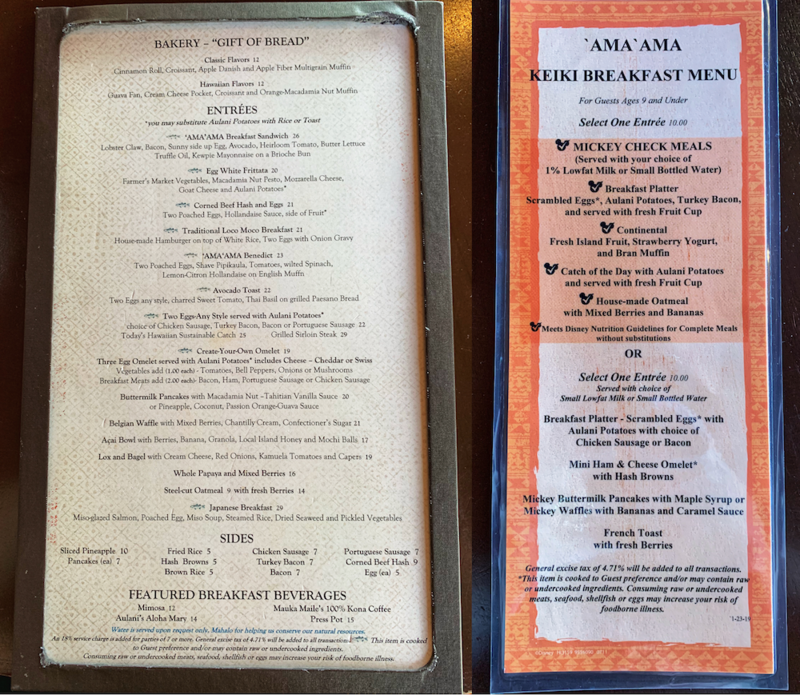 The menus were fantastic, offering an unusually large and diverse menu for adults as well as the Keiki (children’s) menu. The kids’ options were much more elaborate than the usual Disney lineup, offering nine different choices to spark the interest of even the fussiest of eaters. Of the three kids in our group, two were my children that you are mostly all aware of by now — my son is nine, and my daughter is eleven, joined by my niece who is eight. 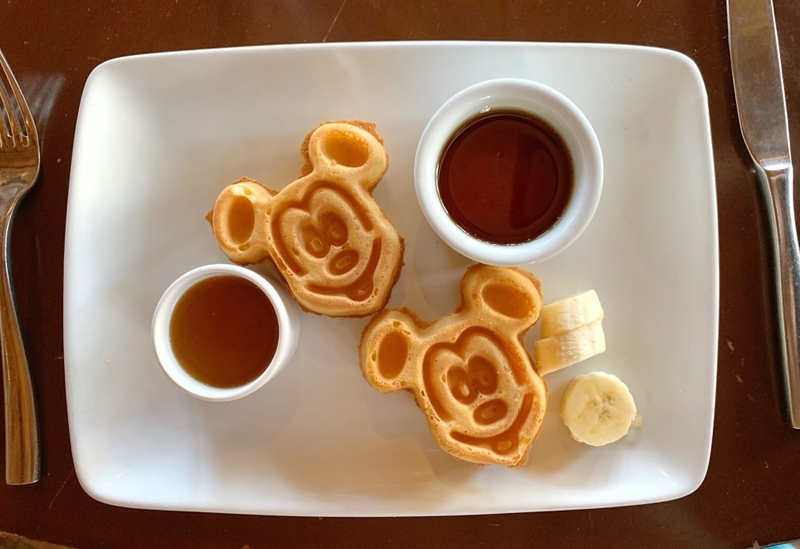 The younger two were keen on the Mickey Waffles that came with caramel sauce, and my daughter was able to easily order from the kids’ menu (unlike last time), and settled on the pancakes. There was actual silence once the food was served which is unheard of when the three of them are traveling together, so we took this as a sign of success. The kids’ meals were very cute but admittedly small. 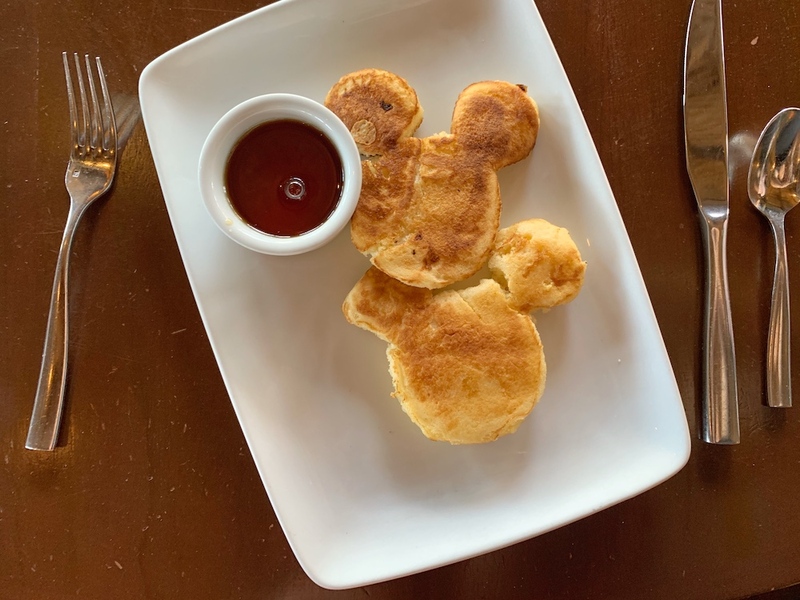 The Mickey Pancakes were a little rough around the edges, which wouldn’t have been as noticeable had the waffles not been in almost perfect Mickey formation. When our server returned to the table to check on the kids and see how they were going with their drinks she did my ultimate favorite thing: She asked us, their parents, if we would like them to have refills. I really struggle with it when never-ending soft drinks and juice are plopped down without asking, often before your current drink has reached less than half full; I find it wasteful. And just because you can have more doesn’t mean you want more or should have more. Asking before giving my kids more “special” drink is always appreciated and Jocey was very thoughtful to do so. We ordered the Two Eggs Any Style with Aulani Potatoes, which may I tell you are uniquely delicious and may have ruined every other potato in existence for me. Eggs were scrambled and bacon was a no-brainer. This was much better than it needed to be. 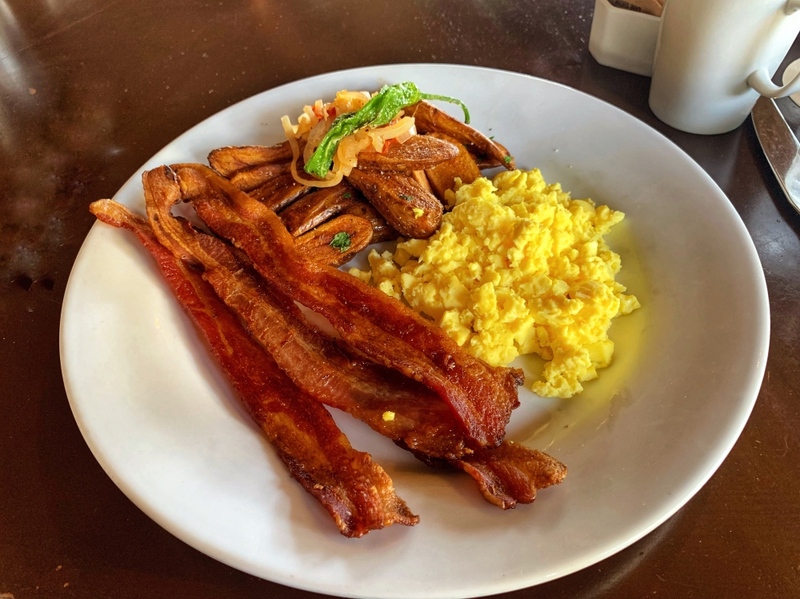 Bacon was crispy and plentiful, not the two pieces of dried up, shriveled bacon you usually get with this breakfast in other places. And those potatoes, I am telling you, were a force to be reckoned with. 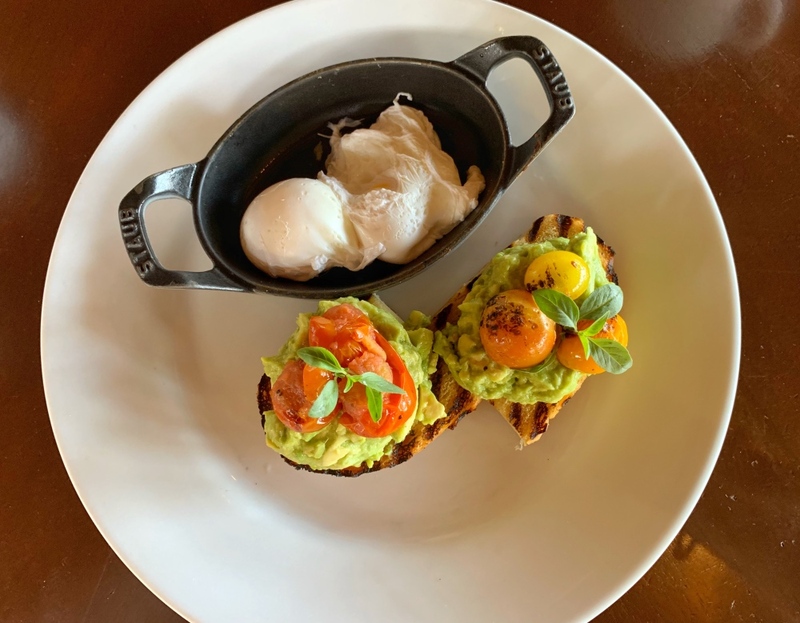 Next up was the Avocado Toast with poached eggs which were served in their own cute little dish. When ordering avocado on toast, you can often end up with a whole lot of plain bread and a light schmear of green avocado substitute, which wasn’t the case here. The bread was a grilled paesano bread and was loaded with the good green stuff. The eggs in their own dish was a great idea and allowed you to eat them separately if you didn’t want to mix the two, or relocate them to make your own perfect breakfast mess. Lastly, we ordered the Acai bowl with an impressive selection of island fruits and excitement. A great option for a lighter breakfast or those avoiding the usual breakfast fare. It was also an excellent option for those super hot Hawaiian mornings where you can’t imagine putting anything that was cooked with heat near your body. Not your usual fruit inclusions either. 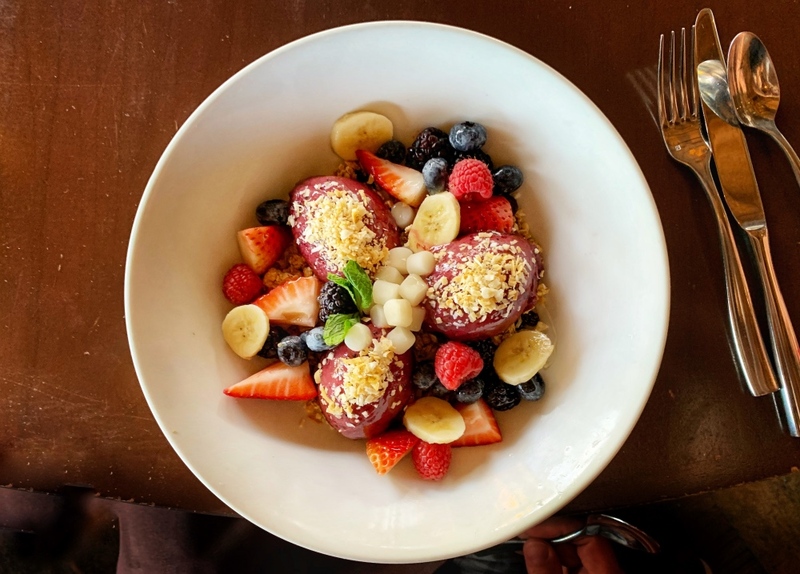 Where most places love to include a series of cheap-to-serve melons, here arrived fresh strawberries, blueberries, raspberries, and bananas teamed up with macadamia nuts and local honey. How can anyone go wrong? As we finished our meals and contemplated moving on to our next activity for the day, we felt anything but rushed. Our server brought the cheque when requested which came to $129 USD and didn’t contain any automatic service charge, despite being a party of six. I always appreciate it when an automatic charge isn’t left. I find it to be presumptuous and if our server is particularly lovely, I often would have given them more had they just left me to my own devices. All in all, ‘AMA ‘AMA was a beautiful way to start the day. The setting is removed just enough to save you from the screams of the neighboring water activities but close enough that it only take a short stroll to get there. 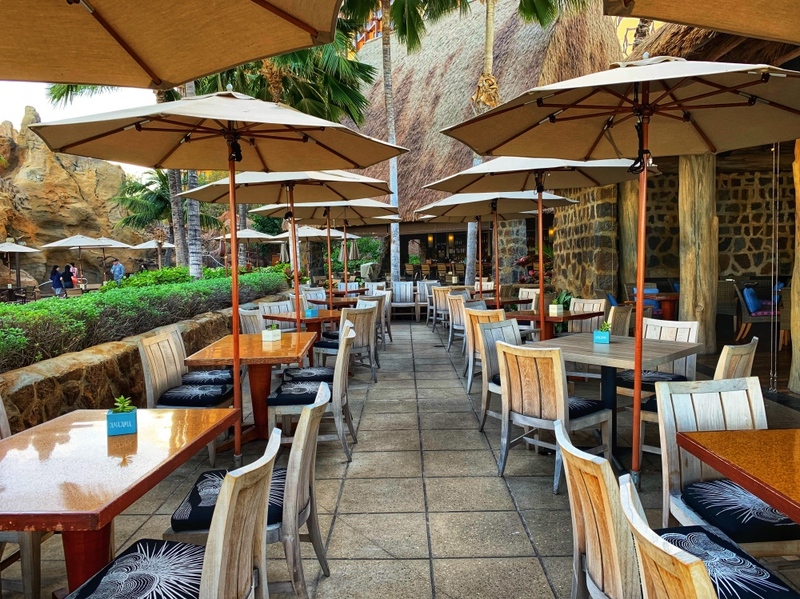 The staff are all friendly and easily create that feeling of hānai — which is the Hawaiian word for a family-like connection with someone that isn’t part of your bloodline, almost an informal adoption. Though again, that is the Hawaiian way, not limited to or more pronounced at a Disney Resort than throughout the Hawaiian islands. If you have the chance to go, definitely add this table service location to your to-do list.